I love my job because I get to take pretty little dogs like this, bust them out of the shelter for a few hours, and have a girls’ day out. Yesterday’s adventure started at the studio for channel WUSA9 here in DC. 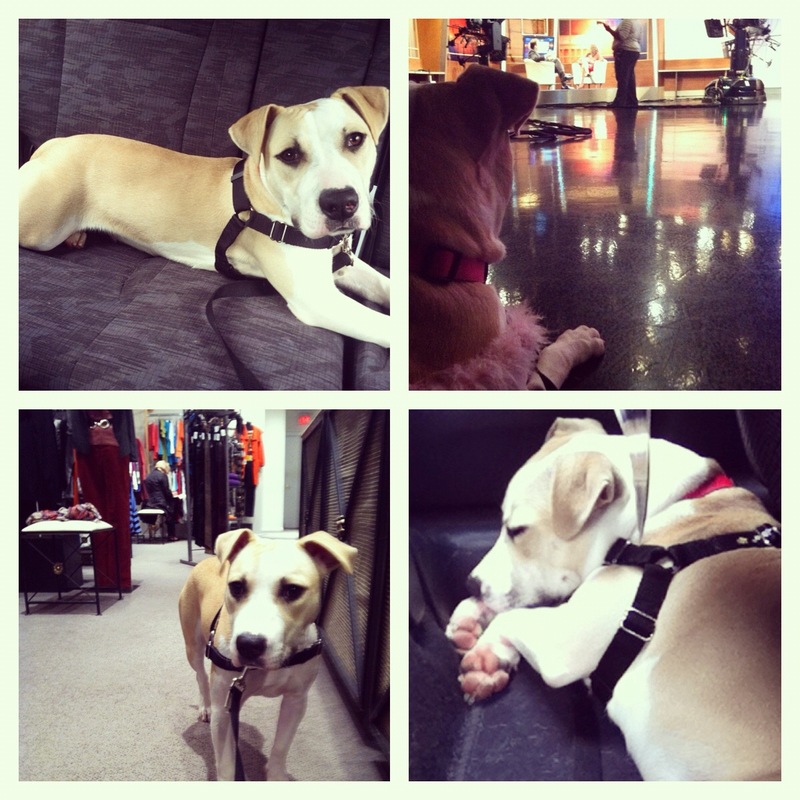 Angel, the sweet pittie pictured above, was getting her time in the spotlight! Angel loves people, is easy going, and looks great in a dress, so I knew she’d be the perfect adoptable candidate to brave the cameras for a day. Boy did she work it! 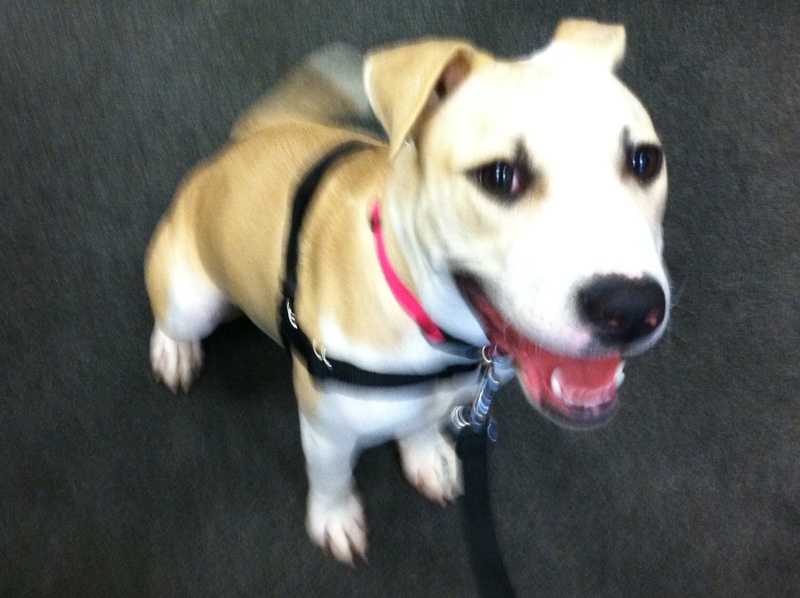 Angel soaked up the attention, behaving as just that – a little angel – for our live 45 second clip on PetLine9. You can check out the video on their website. 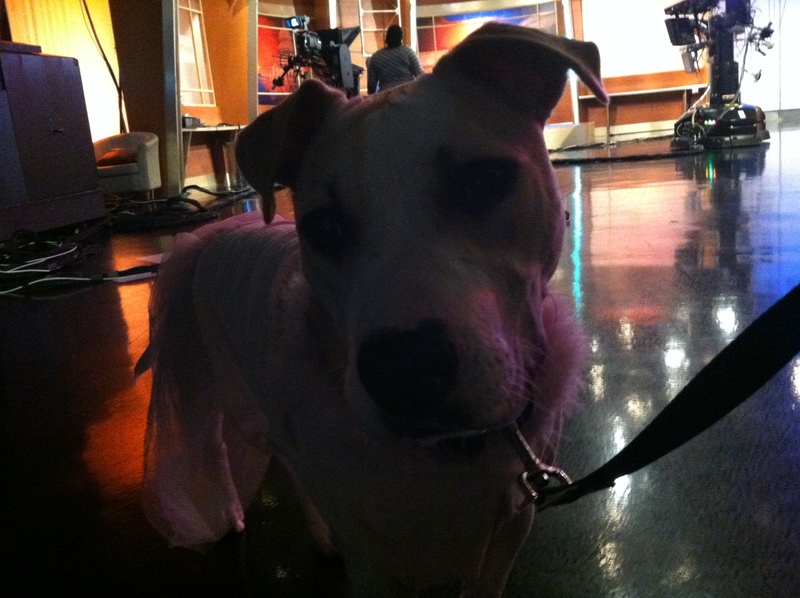 We got to chat about our upcoming gala, The Love Ball, as well as little miss Angel. Notice that I talked about Angel as an individual, and didn’t relay assumptions based on her “breed” – only about what I’d observed myself. I was able to be honest with potential adopters, and didn’t have to use any generalizations based on what kind of dog she might be. 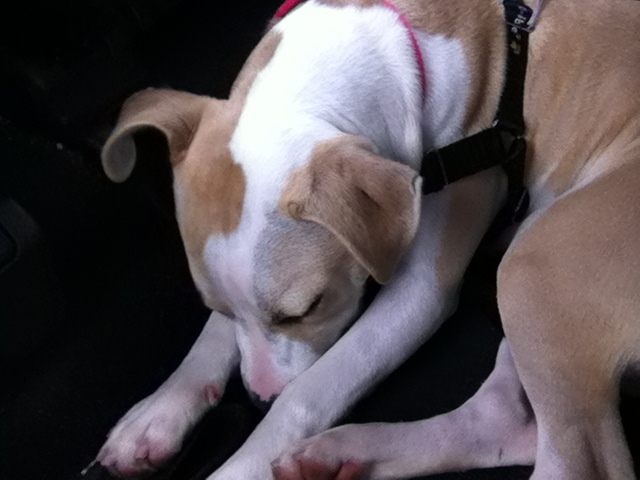 The adventures left Angel totally exhausted, and she passed out on the ride home. She looked like such a sleepy puppy, even though she’s closer to one year old. Her efforts to keep her eyes open as we drove home were so endearing. Angel is a dog who doesn’t show well in the shelter because of her sometimes extreme hyperactive puppy behavior, but turns into a close-to-perfect dog in the “real world.” She walked well on her leash (using a Sensible harness – my new favorite walking gear! ), she greeted strangers politely, and she picked up quickly on basic behaviors I was asking of her in just the few hours we hung out. If the stars align in a few weeks, she is well in the running to be my next foster – though hopefully she’ll be adopted by then! Spending the day with such an awesome dog was a great way to head into the weekend. Hopefully someone noticed her and her snazzy dress on the news and will come to the shelter to visit her! In the mean time I will continue to spend time with her every day to spoil her with treats and well-deserved attention. Hope you all have great weekends adventuring with your pets! 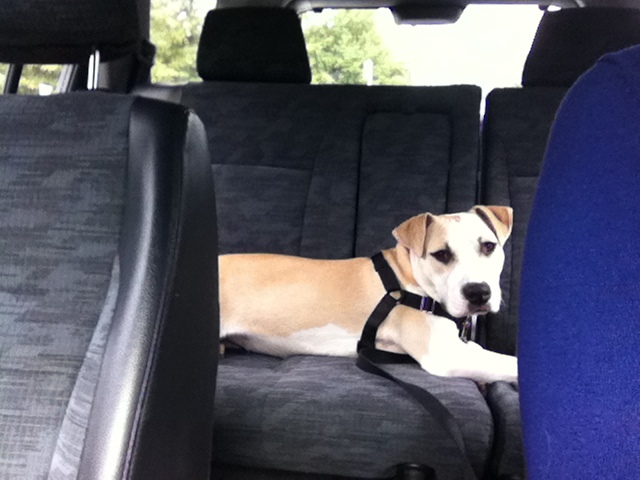 This entry was posted in Dog talk, Rescue/Humane Society, Uncategorized and tagged adventure, Angel, girls day out, Petline9, pit bull, puppy, shelter dog, shopping, tv, tv star, wusa9. Bookmark the permalink. I would LOVE to see Angel as your foster :) Although of course, it would be great to see her in a home of her own. Thank you for what you do… I think that you are an angel too! One thing I love about Angel are her eyes… it looks kind of like she is wearing mascara and eyeliner! Pretty girl. He’s adorable! Hope someone springs her from the shelter soon!